Madrid romantic hotel guide is a selection of what we believe are some of the most charismatic and romantic hotels in Madrid! depending on their average pricing. A quick word on Madrid hotel prices, due to offers a weekend special in a comfortable category hotel can quite easily work out cheaper than the cozy hotels depending on the offer! La "creme de la creme of Madrids romantic hotels offering 5 star, world class luxury and pampering. Although not so expensive as other cities! The obvious star amongst stars is the Ritz for pure history and class however its our belief that the ME Madrid Reina Victoria offers the most romantic experience! 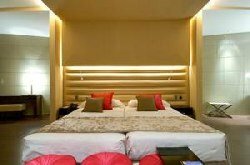 Centrally located in Plaza Santa Ana and tastefully decorated in a smooth modern feel with mood lighting this Hotel has everything a couple could want! Enjoy a candlelight dinner in the open air rooftop restaurant whilst watching the sun set over Madrids skyline before sipping cocktails from the comfort of your private jacuzzi on your individual terrace! If that wasn´t enough the hotel also offers a special "Romance package". The Ritz in Madrid enjoys a unique location between the famous Pardo and Thyssen museums and offers guests the true lap of of luxury! The historical elegance of the building and unparalleled service levels mean even the most demanding clients are immediately pleased! The Vincci capitol is in the heart of Madrids bustling Gran via surounded by Madrids finest restaurants, bars and theaters. With its 5 star reputation to protect the service, attention to a clients needs and facilities on offer are of the highest order. The Petite palace Tres Cruces, Small palace of the three crosses, offers a modern facility in the heart of the city. Decorated with a tasteful modern styling of the latest and most upmarket genre the hotel provides a uniquely romantic atmosphere for couples. Enjoying a morning breakfast from the rooftop restaurant in this modern and stylish hotel has thrilled many a couple of the years. The feeling of seclusion in finery is complete as you start the day on freshly prepare food whilst gazing over the city waking up! Special rates and offers are frequently available. 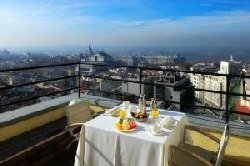 Offering comfortable and ellequently decorated rooms the hotels biggest selling point is its excellent location in Madrids city center. From its central location all the major attractions are easily reached on foot! Tastefully decorated with antique furniture and drapes this hotel is cozy whilst being central and having everything the city has to offer within walking distance! This is the Madrid romantic hotel for those on a budget! Search our database for your perfect Madrid romantic hotel!